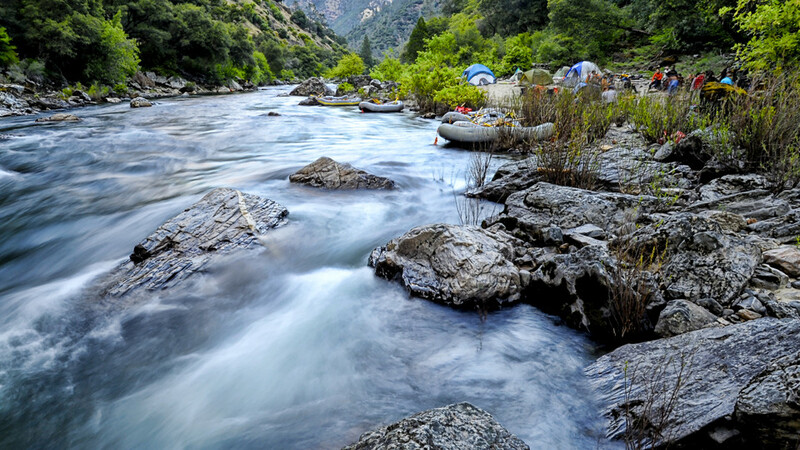 Spend the night in the Tuolumne River canyon. Photo: Luis Escobar Sr.
For more information on how rafting is possible even during times of drought, read our blog post When In Drought, There Is Still Water For Rafting. To view real-time river flow information, go to our Flows Page. Save up to 20% on select Tuolumne trips with Rapid Deals, including multi-day trips and Labor Day weekend. The Tuolumne is a river people return to year after year; it’s not just a “one and done” kind of place. The rapids are thrilling — certainly the best way we know to cool off during a sweltering summer. But the Tuolumne’s remote canyon also feels a world away, a place where our guests take a deep breath, let go of to-do lists, calendars, and meetings and just …… laugh at bad jokes, watch water pour over rocks, splash like pre-schoolers in side streams, space out watching a family of ducks, and enjoy. A 1-Day trip down the “T” allows you to raft the entire Class IV-IV+ section, concentrating miles of whitewater in a single day. But, if you have more time, other options include 2- and even 3-Day trips, slowing the pace down and allowing plenty of time for off-river adventure and relaxation in between rapids. All meals are cooked by your river guides — and yes, they’ll do the dishes too. For the hard-core, there is also the option of combining your Tuolumne trip with a day on Cherry Creek for a Class V adventure that you’ll never forget. Another benefit of the Tuolumne is that it’s only a few hours away from the San Francisco Bay Area, and it’s also very close to Yosemite National Park and several charming Gold Rush-era towns. During normal summer flows, the Class IV-IV+ rapids of the Tuolumne are typically appropriate for those 13 years old and up, making it a good option for families with teenagers and groups of adults. Learn more about the Tuolumne River and the available trip options. Check out our Tuolumne rafting video to see this river up close and personal.